Olive trees have been a boon to civilization for millennia. The oil extracted from olives can be used for everything from fuel for lanterns to medicinal balms to an essential ingredient in foods. It’s easy to understand why the tree was incorporated into so many early religious practices, but near the Mount of Olives in Jerusalem, a grove of olive trees in Gethsemane provides a direct link to ancient biblical stories. Some of the earliest records of olive trees having religious significance come from Ancient Greece. One legend states that the Greek gods Poseidon and Athena competed to gain possession over the city of Athens. Poseidon thrust his spear into the land, causing water to spring forth, but Athena planted the world’s first olive tree near a well. Athena’s gift was judged to be better, and so the city of Athens was named. 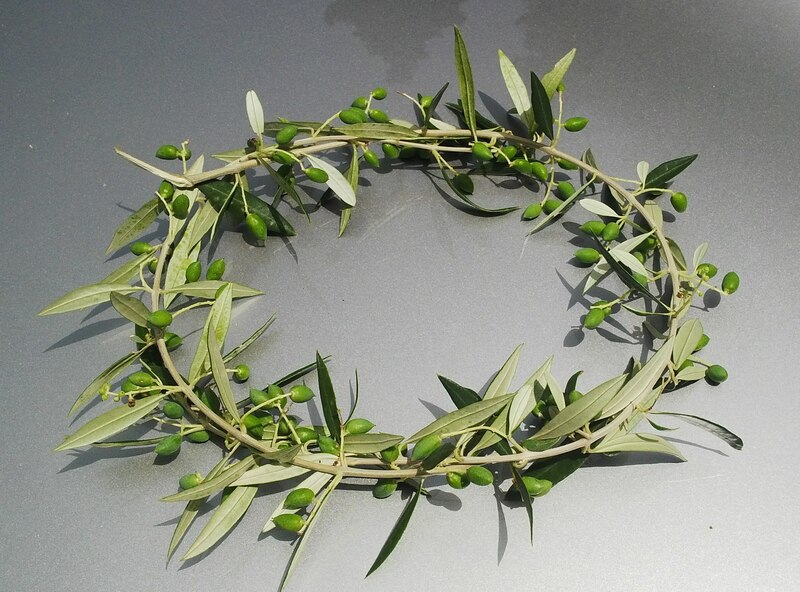 To Ancient Greeks, olive branches symbolized peace, and olive wreathes were used as prizes for winners of the early Olympic games. Much of this symbolism continued on into later religious practices and cultures. Olive trees are also native to the ‘Holy Land’ of Jerusalem, one of the oldest cities in the world, and have been long revered by locals. The Mount of Olives, or Mount Olivet, was named after the many olive trees that grew on its slopes. It’s been used as a Jewish cemetery for more than 3,000 years, giving it incredible religious significance. 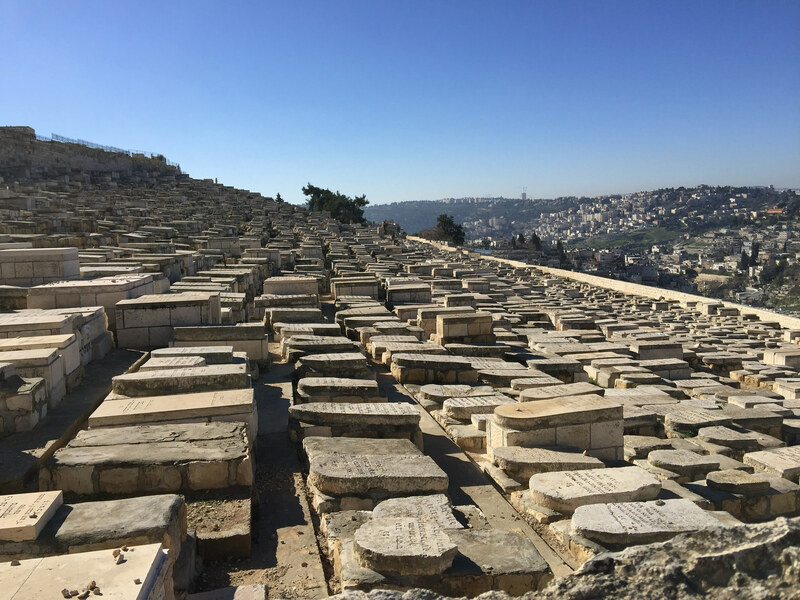 The consecrated land of Jewish cemeteries must be protected under Jewish law, and the bodies buried there need to remain undisturbed in perpetuity. The Mount of Olives is thought to hold as many as 300,000 bodies, including some of the most famous historical figures in Jewish history. The Christian Tomb of the Virgin Mary is also located there. At the foot of the Mount of Olives, a small olive grove would go on to become an important site for Christianity. Gethsemane, taken from the Aramaic word for olive press, is mentioned many times throughout the New Testament as a favorite place for Jesus and his disciples to rest and pray beneath the evergreen olive trees. The Garden of Gethsemane is the location where both the ‘Agony in the Garden’, where Jesus came to accept his coming betrayal, as well as the place where Judas led officials the night of his arrest according to the gospels. 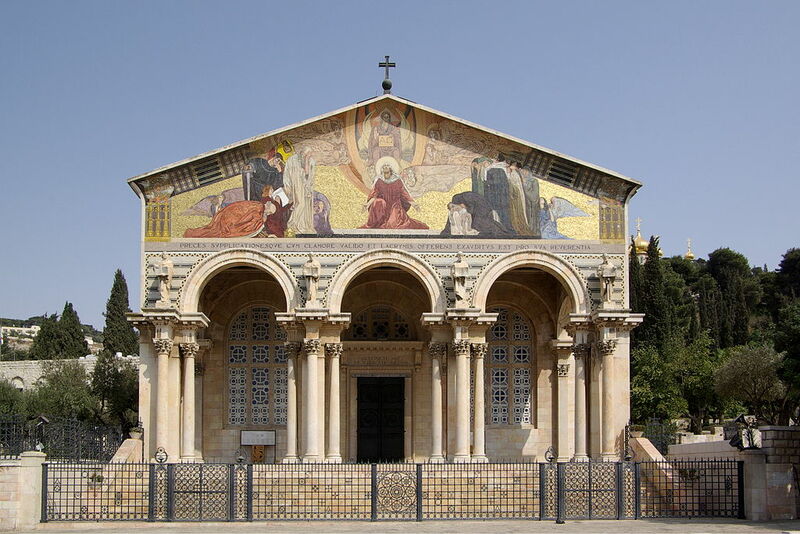 Today, the Church of All Nations has been constructed in a section of Gethsemane, enshrining the ground where Jesus is said to have last prayed. These and other New Testament stories have made the Garden of Gethsemane one of the most revered sites in Christianity. And unlike many other religious stories and traditions, there may be a living link to one of the world’s most well known and significant religious figures. 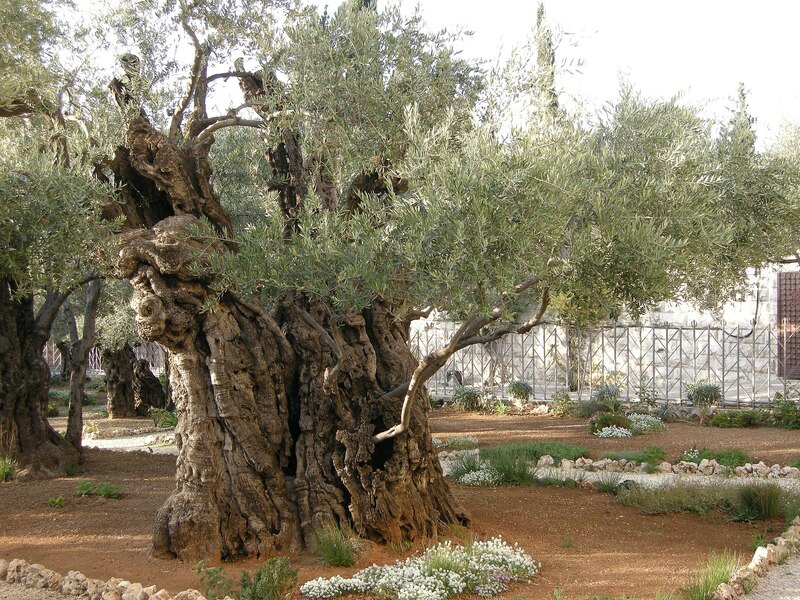 There are still olive trees growing in Gethsemane today, and in 2012 a group of Italian researchers funded by the National Research Council of Italy Trees and Timber Institute set out to determine if they were indeed the same trees Jesus and his disciples frequented. Using carbon dating, they were able to determine the ages of several of the trees. Of the 8 trees tested, only 3 were able to give decent results, as the oldest core parts of the other trees rotted away long ago. Their approximate ages were 1092, 1166, and 1198. While this makes them significantly younger than the events reported in the bible, researchers noted that they are still some of the oldest trees on record. In addition to this, they pointed out that olive trees have the ability to grow back from their roots if the trunk is cut down, so it’s impossible to rule out the possibility that they truly are the same trees. They did note, however, that all of the trees tested were from the same lineage, so it could be that ancient custodians of the land attempted to preserve a specific heritage for future generations. The nature of that lineage has been forgotten to history. Regardless of whether the trees are the same or not, the soil beneath them is without a doubt the same as that referenced in the Christian Bible. Fortunately, the current trees in the garden are healthy and strong, despite the growing pollution from modern developments. They stand as a testament to the often overlooked role trees can play in world history. 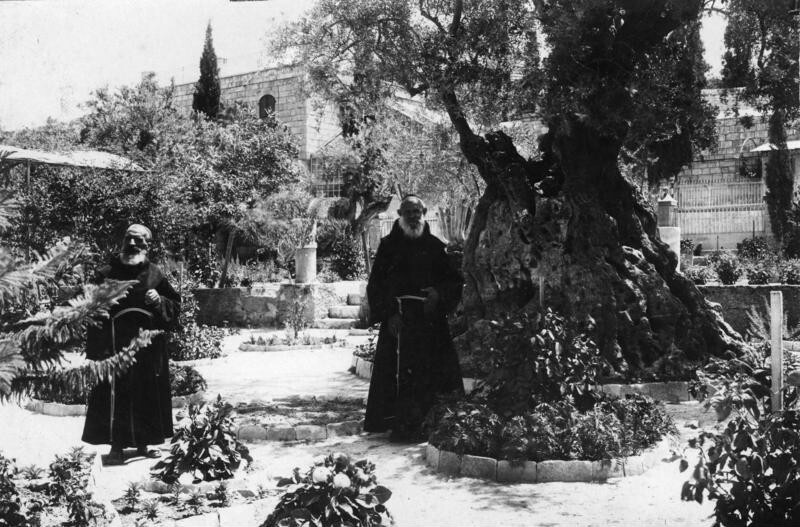 If you enjoyed this article about the Garden of Gethsemane, check out the archive for more tree stories. Also check out the Facebook page, with a few extra tree goodies throughout the week. Subscribe below to receive notifications whenever a new tree story is published. As always, a fascinating topic and information. Another great blog. Trees that have shaped land, culture and existence for millennia and beyond. Unsurprisingly, I’m now in the mood for some olives! You certainly find some of the most of the most compelling of trees! Oh, Getsemani…. We used to hear many stories like this at school, during the Religion classes…. Again, how nice articles!! Thanks Ana! It’s a great example of a real place you can visit from ancient scriptures!